Everyone who came got a glass of beer. And the tithing bowls over-flowed with cash. They still do, although now they're cash registers and almost any brewery or brewpub that opens its doors have to really screw things up not to succeed. 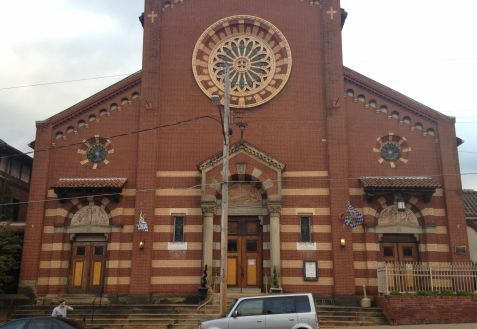 Church Brew Works in Pittsburgh has a direct connection to this story. Housed in an old Catholic Church, its main room is the old sanctuary, the confessional now a waiter's stand; the holy water bowls remain although I was sad beer was not pouring from the fountains. Wife Persimmon & I went there for dinner with a friend who was excited to show off their beer and pizza. Too bad. Wrong night. The well-respected pizza oven was down for repair; the beer fermenters had just been replaced. So, no pizza and only 4 beers; Pale Ale, Bud rip-off, Oktoberfest and a Stout. Bland, watery, little taste, no layers or character. The food was decent; fettucine w/chicken, a vegan stew with kale, potatoes & carrots, a salad full of lettuce, tomato and french fries. (French fries?) Yep. And like the beer, bland & un-offensive so as to please the typical American palate. What do you think my recommendation is going to be? 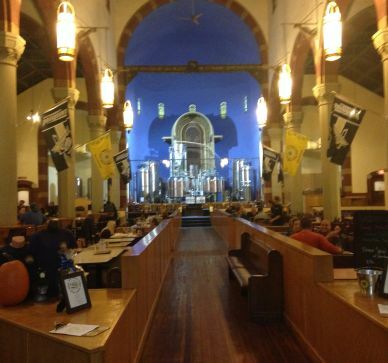 As every reviewer has already said, this brewery is in an old church that's been converted. The former altar now houses the fermenters, there's a very long bar along the one side of the church, and there's what appears to be a brick oven pizza in the front right corner where a side chapel may have been. At first, I was a little confused as to how to view a place like this. Should I feel like a sinner for drinking in a place of God, or should I be pleased that someone has found a use for such a beautiful building when it's original purpose was no longer viable? I settled on the latter and ordered my beer. The atmosphere of the building is obviously quite unique. I digned it a quarter point just because the large building gives it a kind of "cafeteria" feel, with lots of people being loud, lots of echoing, etc. I had a sampler of all their beers, and they were overall pretty good. They were consistently solid but didn't have strong flavors. For those used to other craft brews, this may seem out of place. On the other hand, I sort of appreciate a brewery having a different approach - not every IPA has to be super hoppy, and having a good easy drinking beer isn't a bad thing. The service was mediocre. The waiter was knowledgeable about the beers, but seemed to lose interest in my table when he realized that we were just ordering a few beer samplers (which are a pain for the waiter/bartender due to all the glasses). Church Brew Works is a former Catholic church which was renovated and transformed into a brewpub. What a bold idea! I first saw this place several years ago on Food Network, and had to try it when I visited Pittsburgh. Street parking is free, but can be challenging to find nearby. The area does not seem especially inviting, but once inside the amazing architecture, authentic woodwork, and colorful stained glass decor is inspiring. The three-story building is brick, with steps up to the entrance foyer. The original church pews have been converted into tables, and the altar area at the far end now beautifully showcases their brewhouse's stainless steel vessels. On the left is there long wooden bar and on the right is the kitchen area. Behind the large serpentine 22-chair wooden bar are six stainless steel fermenters. Down the center and on the right are dining tables flanking by massive structural columns. The divinely high ceiling creates an open atmosphere, and the decor is splendorous. The upscale menu is deliciously creative, and the service is adequate. They have 10 heavenly well-crafted house beers on tap, and after trying their sampler I was thrilled. The Bell Tower Brown, Pious Monk Dunkel, Pipe Organ Pale, and Oktoberfest were all better than average beers. The Blast Furnace Breakfast Stout was brewed with coffee and oatmeal - yum! Their Overkill Double IPA (8.0% abv), Cherry Quadzilla (10.3%), and Wheat Wine (9.5%) are all excellent, and I gave a perfect score to their Extreme Double India Pale Ale (9.3%)! Church Brew Works is a must-visit brewpub that offers bold inventive beers in a truly unique dining atmosphere. We visited on a Saturday afternoon for lunch and some beers. As the name implies, this used to be the St. John the Baptist Church. It has been restored to itsâ€™ former glory and the interior is beautiful. 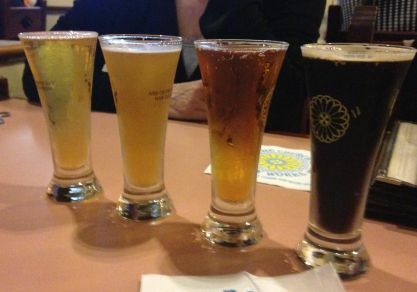 The sampler consisted of eight five ounce beers for $14.25. We tried their Pilsner, Pale Ale, Dark IPA, Dunkel, Trippel, 4-Grain Lager, Octoberfest, and Stout. The beers were all good but none stood out as great. All the food, from appetizers to dessert was outstanding. Parking was easy to find on the street, might be a bit more challenging on a Saturday night. It was a bit chilly outside so I didnâ€™t see or look for the outdoor patio. They had bottles, growlers, and mini-kegs to go. The brewpub is non-smoking. Just like much of the city, these brews draw much from German heritage. We werenâ€™t completely wowed by any of their beer offerings, but would be interested in coming back to try some again â€“ especially the seasonals which are constantly being refined. Pious Monk Dunkel: 4.3% ABV. Ideal for those who like a more pronounced flavor to their beer without the typical heavier alcohol and hop content of the darker lagers. This Dunkel has a very strong, dark color to it but itâ€™s surprisingly softer and less woody than you might expect and comes with a slightly sweet wheat taste and a momentarily bitter finish. Winner of a bronze at the World Beer Festival (2000) and the Great American Beer Festival (2001). Thunderhop Double IPA 8.00% ABVâ€“ A definite woody, even slightly grainy taste from a clear, brown beer. Thunderhop has a definite orange aroma, it doesnâ€™t have the sticky almost chewy taste of an IPA; and is much sweeter than one would expect from something with this kind of name, and from this kind of beer family. It is actually a very good beer in its own right, but someone who loves IPAs for their specific characteristics and expects to find them in the Thunderhop might be disappointed in this one. I questioned the logic of making a cheese steak out of Kobe beef until I actually tried it. wow! Start off with some non traditional pierogies, (beef stroganoff),and ease into a Blast Furnace Stout or the Dunkel. When people ask me where to go when they are in Pittsburgh on business or for pleasure, I insist that they pay a visit and it is always a good call. You'll want to take some beer home but it is very difficult to sneak it into your overhead on your flight, so you may have to rent a car to drive it home. The Church Brew Works has a nice variety of brews. Most of them were very predictable in terms of style. They had a milk stout with oatmeal and coffee - unusual, and very drinkable. They called it a breakfast stout. The server was able to recite a detailed description of each brew. The food on the restaurant side was slowly served, cold on arrival, "just" average in quality, miserly in portion, and way too expensive. The beer was too expensive too. Overall, the building was nice enough to look at, but as a brewery and restaurant, it falls into the category of "too expensive to be this average." First of all, this is the most impressive building for a brewery I have ever seen. Wow. I usually don't like wide open bars, but this was so cool I didn't care. Service was pretty good. Sat at the bar. Food was below par. My fries were cold and tasted freezer burnt. My cheesecake also tasted freezer burnt. The burger was average. I have heard that this place has gone down hill recently. They need to step it up, and match the whole experience with the atmosphere. I found out about this brewery through the Beer Mapping Project's mobile version when I found myself with a half day to kill in the Pittsburgh. As with other reviewers, I was impressed with the layout, I mean who wouldn't be? It the melding on two great religions! I ate a specialty pizza that was very good and tried on 3 of the beers they had to offer. I found the pale ale to my liking and stuck with that. If ever I find myself in Pttsburgh again, i would probably take the time to go again. I was in Pittsburgh for work and Cubs â€“Pirates game. I decided to stop by here for lunch. The parking in back makes this an easy stop. After figuring out the correct door and walking in past the vestibule, the inspiring sight of the restored interior of the church greeted me. Very high ceilings including barrel vaults on each side make this a very airy space. On your left is a long bar and some tables. Main dining area is on the right side of the center walkway. Note the booths look like they have recycled the pews. The brewing equipment is set up where the alter used to be. There are original stained glass windows with various Saints on them. Large arched pillars, exposed brick, wide beam pine plank floors and great old lighting add to the ambiance. Service was friendly but they were slow to seat me and a bit slow to take my order. After that, they were on top of it. While fairly crowded, the patrons were very reserved. Maybe itâ€™s the church vibe that keeps the volume down? They offer 7 or so regulars plus seasonals. My dunkel was right to style. You can order 12 oz glasses or pints. They also offer beer to go. Beers are reasonably priced. They have made the old courtyard into a beer garden. It is called the Hop Garten if memory serves. The food is decent and goes beyond the usual pub standards. Lots of daily specials add to the variety. This is well worth a stop just for the building alone. Luckily they also offer good beer and food to make it worth your while. Upon first walking up to this place it seems quite a site for a brewery. Upon taking your first step in...you realize you are actually in a real church, one that sells beer. I will admit, aesthetically, the place is quite impressive. That's where the amazement ends unfortunately. Out of the four of us, we tried 7 different beers and were not impressed with any of them. My hefe was actually probably the worst i'd ever had. All the beers seemed somewhat flat, and even upon inquiring about it to our server she said it was kind of "their thing." On to the food, mine was alright, but it's hard to mess up a salad. 2 of the 4 actually said their meals were not that good at all. For the price the church works charges you would hope for greater quality. We decided to leave not even getting a 3rd round of beers because we were that unimpressed. The night before we went to the north country brewery in slippery rock, pa...maybe that skewed things a bit (as their entire operation was fantastic). To further pile on, we saw our waitress at a bar later that night and she admitted that the place really wasn't that great, and our cab driver said he had heard similar things. To sum, the beer was average at best and some of the food was good, some bad, but generally overpriced. The look of the place is quite impressive but there is very little "atmosphere." recommendation: go there to try a beer and see the inside, but i wouldn't plan on eating. Really an interesting location, acrossth street from Iron City. Located in an old church, you sit in the pews and the actual brewery is in the alter. A true place to worship beer. And the lucky thing is you can, the beer here is top quality. Favorite beer is definitely pious monk dunkel, but I have had a few decent specialties here as well. The real thing to talk about besides the atmosphere is the food. Excellent beer cheese soup. They are known for their pierogies- a different flavor everyday with the most unusual probably rattlesnake. Definitely worth the trip.